After months of speculation and rumors, Google finally took the wraps off its new and more powerful Pixel – the Pixel 3, soon after Apple launched the iPhone XS with bigger screen in small design. Big screens are all the rage these days, but if you’re one of those you would like their phone screens not more than 6 inches, then it’s hard to find anything that can compete with Google Pixel 3 and iPhone XS. Both are powerful smartphones with incredible cameras and spectacular displays, packed with some top notch features. Although they may run different operating systems, they are both ahead of their game when it comes to premium smartphones. The competition is tough, but there can only be one winner. We pit the two premium range smartphones Pixel 3 and iPhone XS against each other to see who comes out on top. 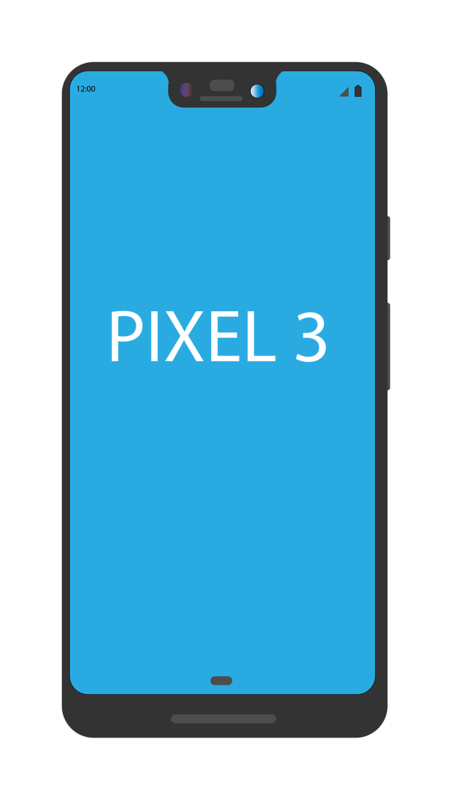 What is Google Pixel 3? Google announced its next flagship device, the Pixel 3, along with the bigger Pixel 3 XL at its “Made by Google” event in October 2018. Pixel 3 is the ultimate Android experience complimented by a more powerful camera. The world’s best smartphone camera has got even better with the Google’s first AI-powered phone – the Pixel 3. It helps you take better photos and helps you in your problems in exciting new ways. The notch is probably the most noticeable addition to the new Pixel 3 and it brings everything you expect from the Pixel brand. The new Night Sight mode works like a wonder but the new AI engine is the center of attraction of the Pixel 3. 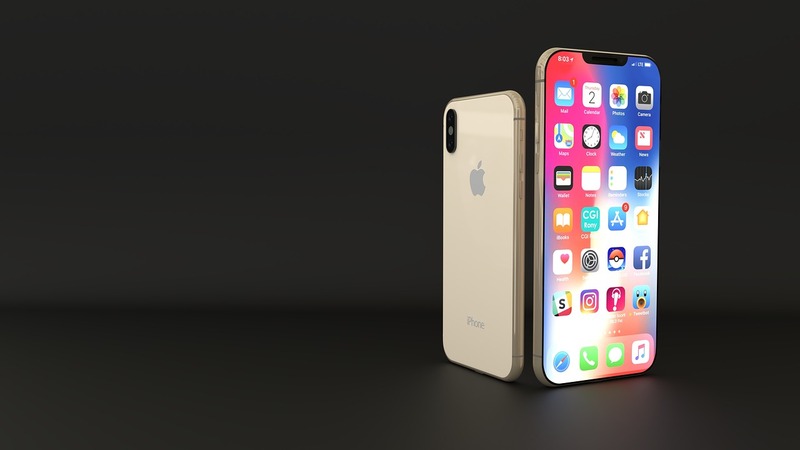 What is Apple iPhone XS? Apple’s new flagship phone, the iPhone XS looks almost identical to its predecessor, the iPhone X, with the same 5.8-inch screen but the iPhone XS is faster and takes better pictures than iPhone X. Launched along with the iPhone XS is the Apple’s biggest phone ever, the iPhone XS Max which comes with a gigantic 6.5-inch display. As far as the camera is concerned, the iPhone XS packs a 12 MP (f/1.8 wide angle lens) primary camera and a 12 MP (f/2.4 telephoto lens) secondary camera, and a 7 MP front camera. In terms of design, it’s beautifully crafted with an all glass design with a rounded stainless steel bezel, but the protruding vertical camera alignment can be annoying at times. Pixel 3 looks identical to the Pixel 2 which is a nice-looking Pixel with a matte finish back and sleek, but not good enough to match the looks of the iPhone XS which feels more premium, owing to its all glass design which is made of surgical-grade stainless steel. The iPhone XS is wonderfully crafted and the glass is the most durable in display segment. Pixel 3 has a 5.5-inch screen with a 2160 x 1080 OLED display, while the iPhone XS has a bigger and better 5.8-inch screen with a True Tone 2,436 x 1,125 OLED display. On the back of the Pixel 3, is a 12.2 MP sensor, with f/1.8 aperture and optical image stabilization (OIS). The camera software uses machine learning to enhance image processing for better pictures, even in low light conditions, thanks to the new Night Sight mode. The front camera is a dual-camera setup, both 8 MP sensors with one wide-angle lens to improve coverage. The iPhone XS, on the other hand, features dual cameras on the back – a 12 MP (f/1.8) wide angle camera and a 12 MP (f/2.4) telephoto camera – with a True Tone flash and it has a 7 MP front shooter for selfies. Pixel 3 comes with the powerful Snapdragon 845 processor and 4 GB of RAM for a power-pack performance and an ultimate Android experience. But the Pixels are never about hardware as they are about software. The new AI engine makes the Pixel even better than its predecessors. But even with the high-end specs, Pixel cannot match the raw performance of Apple’s hardware. That being said, iPhone XS is powered by the new and improved A12 bionic chip – the Apple’s first ever 7nm chipset which includes the next-gen “Neural Engine” for features like Face ID and animoji. The Pixel 3 starts at $799 for the basic 64GB variant, while the iPhone XS costs $200 more for the same storage model. Neither of the phones have expandable storage which means you have to manage with whatever you have. The 128GB variant in the Pixel 3 goes up to $899, if you want to go with a higher capacity model. If you can go any higher, the 256GB iPhone XS costs $1,149 and there’s a 512GB variant too, which costs a whopping $1,349, which is among the most expensive phones you can buy. Pixel 3 is the better value product but if you don’t mind going on the premium side then iPhone XS is your thing. While both are premium range phones with top notch features and incredible cameras, Pixel 3’s offerings are not enough to justify its hefty price tag and iPhone XS is insanely pricey. Pixel 3, however, takes a firm approach to software and its new AI engine helps with better image processing which aids in exceptional low light photography. But considering iPhone cameras are among the best smartphone cameras in the world, iPhone XS’s camera is a camera par excellence with exceptional detail and dynamic range. That being said, comparing the best two smartphones seems like a tough one, however, considering, users are loyal towards their favorite brand, they may very well know which one to buy. Sagar Khillar. "Difference Between Google Pixel 3 and iPhone XS." DifferenceBetween.net. 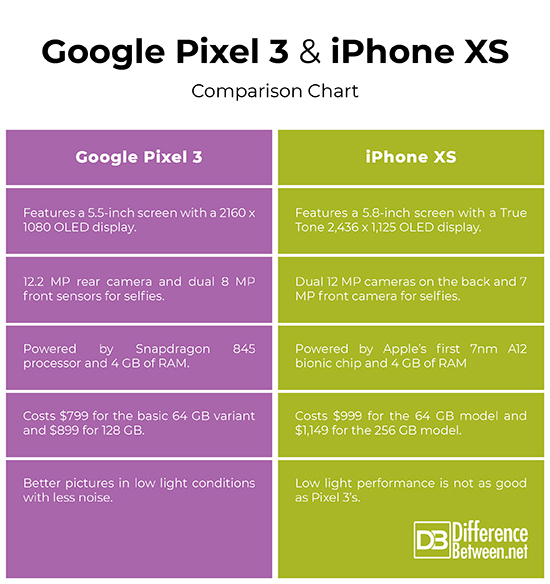 March 5, 2019 < http://www.differencebetween.net/object/gadgets-object/difference-between-google-pixel-3-and-iphone-xs/ >.